I am preparing to make a purchase of all-terrain touring XC skis (sidecut 83-62-70 mm), with which I will use SNS XA boots and bindings. I know that the rule of thumb for regular XC skis is to go to about 110% of your height for the length of the skis. However, these are more similar to what downhill skis used to look back in the 80s than the regular (competition) XC skis and are meant to be able to handle rougher terrain. I used to alpine downhill ski similar skis before I started snowboarding about 20 years ago. I always preferred my skis to be slightly on the shorter side for more maneuverability. 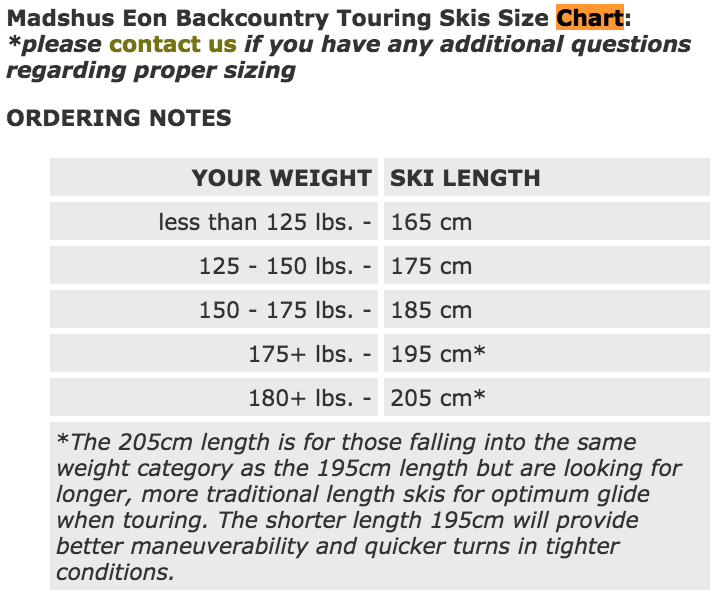 I am about 6'2" (185 cm) and I have an inkling towards 175 cm touring skis. Considering that I plan to do a little bit of all kinds of touring (trail and BC) with these skis, should I actually try to go with a little longer (185 or 195 cm)? Your height is less important than your weight. When fitting for modern XC skis, the best thing to do is actually stand on the skis and test their flex. You want skis that will make contact with the ground in the kick zone while you're standing on one foot, but suspend the kick zone while distributing your weight through both feet. This provides you with maximum glide length. Factors such as how much extra weight you'll typically be carrying need to be factored as well, if you're going to be skiing with a backpack for example, then you need to consider a ski with a stronger flex. When they size you up at the shop, they actually have you stand on the skis and they slide a leaf gauge tool under the skis to check how much of the kick zone is suspended. You can do the same test with a sheet of paper at home on a hard floor, but not typicallybefore you buy a pair. If you want to order online, go to a shop first, find out what your size is, then order that size online. I'm 5'11" and I ski on a 196cm ski for racing. If you're interested in greater maneuverability, then a 195cm would probably be appropriate for you too. As mentioned above, you should check the flex of your skis, but skis are made with different stiffness's, so you should be able to find a ski that matches both your weight and height. If you're planning to ski with a backpack or something similar on in the BC, I would warn you that it will probably be a pain.